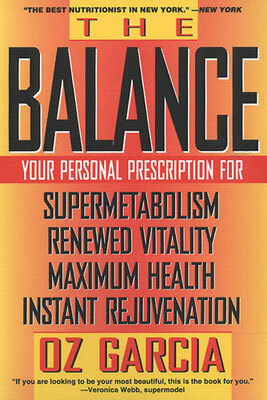 The Balance – book by Oz Garcia: Your Personal Prescription for Super Metabolism, Renewed Vitality, Maximum Health, Instant Rejuvenation – Buy it now from Amazon.com. The Balance is a personalized plan to correct metabolic imbalances and boost your body’s efficiency by combining nutritional planning and exercise with cutting-edge supplementation and stress management. With a 45-question quiz, Oz will help you define yourself as a metabolically fast, slow, or mixed burner. Even if you suspect you know what kind of burner you are, Oz will enlighten you with specific foods, supplements, types of exercise, and lifestyle suggestions to try–including tips for eating out–to help improve your metabolism and overall health. The program is remarkably flexible and realistic. The goal of this revolutionary and personalized plan is to correct metabolic imbalances and bring your body back where it is meant to be, into The Balance. Based on your answers to a 45-question health and lifestyle quiz, you will enhance energy and endurance, improve concentration and mental function, achieve better ability to cope with stress, reduce premature aging, build a stronger immune system, improve digestion, end mood swings, control PMS and menstrual cramps, reduce the risk of developing heart disease or cancer, as well as many other benefits.